The Toronto Raptors had low expectations entering the 2013-2014 NBA season. Under new GM Massai Ujiri, the team planned set their sights on acquiring a top pick in the loaded 2014 draft. They got rid of Andrea Bargnani, sending his albatross of a contract South of the border to New York, and traded their leading scorer, Rudy Gay to Sacramento. But as their season reaches its halfway point, those plans to tank for 2014 have changed. A former Trojan is a big reason why. 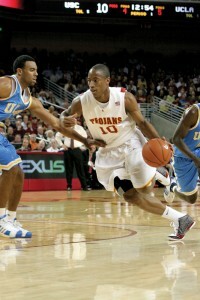 DeRozan, seen here playing with the Trojans in 2009, is only the 4th Trojan ever to play in an All-Star game. Raptors guard DeMar DeRozan, who played with USC during their 2008-2009 season, has led the Raptors to a 24-21 record, good for first in the Atlantic division. He is leading the team in points per game with 21.8, and has upped both his rebounding and assist number as well. Fran Vogel, the head coach for the Eastern Conference in the upcoming NBA All-Star game, and the man responsible for selecting the East reserves, has clearly taken notice. On Friday Vogel named DeRozan, along with Chris Bosh, John Wall, Roy Hibbert, Paul Millsap and Joakim Noah as backups for the Eastern Conference in the upcoming All-Star game. DeRozan is just the fourth Raptor ever to be named to the All-Star game, and the first former USC Trojan to be honored with a spot in the game in 31 years. Prior to DeRozan, Gus Williams was named to the All Star game as a member of the Seattle SuperSonics in 1983. DeRozan is the 4th Trojan ever to be named an All-Star.